Slow stitching centres around the philosophy to ‘make do and mend’ or ‘waste not, want not’, an ethos of yesteryear. It is a nod to the generations that came before in which reusing and recycling were necessary and admirable. It is not a complicated process which relies on numerous fancy, perfectly executed stitches and fastidious neatness, rather, it embraces the timeworn nature of materials, and the individuality of hand-stitching methods. Simplicity is key. Lisa first found a love for fabrics and textiles in high school, where her unique creations made from strips of fabric which were knitted, woven and embellished with embroidered flowers made from beads and sequins led to her being invited to exhibit in ‘ArtExpress’. Lisa then gathered expertise as a textile artist, florist, food stylist, and visual merchandiser, leading her to run an upmarket florist and homewares store in Sydney’s eastern suburbs for many years. These experiences and her long-standing passion for vintage fabrics and embroidery made Forage by Lisa Mattock a natural step. 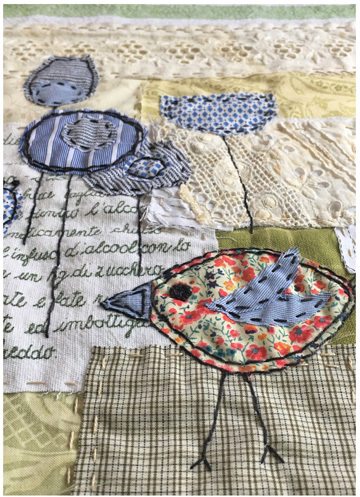 Forage allows Lisa to discover and collect reclaimed fabrics and embellishments and share her passion for creating intricately layered textile artworks. 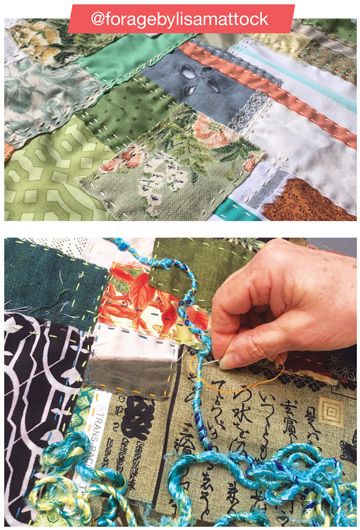 Bring along your fabric collections and learn the art of combining old fabrics to repurpose them in a contemporary, unique way. This class is designed so that there is no ‘one size fits all’. There are no templates to follow, no right or wrong way to approach your Slow Stitch project.